This is a big book in every way: long, heavy, expensive, and content full. But far more than that, it is a big book because of the role it should, indeed must, play in the history of Bhutan itself. The History of Bhutan constitutes an important moment in the history of Bhutan. Dr Karma Phuntsho is perhaps Bhutan’s best-educated social scientist, a leading scholar in the field of Buddhism and Bhutanese Studies, and an experienced researcher. Most important, he approaches these fields and his work with a mind trained in contemporary methods and with an ear attuned to the historical needs of our present time. The importance of this volume rises not only from the information that its content conveys but also from the essential role it must play at the present time. The issue of the Druk Journal for which this review is written focuses on the issue of identity, more specifically on national identity. But national identity does not simply “exist”; it does not arise naturally in the consciousness of the members of the kind of community we call a “nation”. It must be formulated, given life through its reification in the writing of history; in painting, performance, music, architecture, in short, in all the arts; it must be analysed by the social sciences. National identity is not some vague feeling hidden away in the recesses of one’s persona. It comes into existence and develops through our interaction with external objects and activities that serve to make it possible for us to recognize ourselves through them. Our consciousness of ourselves, here our national identity, grows in a dialectical relationship with all the products of the mind and the soul (dare we use such a word in a Buddhist nation?) that help us to identify ourselves as members of one group rather than another. The real purpose of cultural preservation must be not to attract tourists but to make it possible for us to identify ourselves in contrast to those who inhabit a different culture. Consciousness of national identity declines when airports all over the world begin to look alike, when our cities begin to resemble each other, and when the trash and garbage we produce in Thimphu is only smaller in quantity but not different in kind from that produced in New Delhi. Karma Phuntsho is at great pains from the very outset to make clear that his purpose is indeed to lay the groundwork for the development of national self consciousness. One could add that, indeed, the development of national identity and self-consciousness can be hindered by a reluctance to recognize both the fact and the necessity of the distinction, in our case, between Tibet and Bhutan. For example, the reluctance to modernize the spelling and style of written Dzongkha to bring it closer to the spoken language on the grounds that to do so would distance the culture from its Tibetan roots is, in fact, counterproductive to the extent that it weakens the particularity of Bhutanese national identity. In other words, the argument about the relationship between contemporary identity and cultural roots can cut both ways. This issue, put more broadly, is raised by Karma Phuntsho’s text. The relative weight he gives to Buddhism in his discussion of Bhutanese history, most particularly in the premodern centuries, raises the question of just how tenuous indeed is the relationship between Bhutan and Tibet or, more precisely, between Bhutanese and Tibetan cultures. The fact that Bhutan is Bhutan and Tibet Tibet is not at issue. Rather, the problem Karma Phuntsho’s book puts before us, in my opinion, concerns the way in which we can identify a distinctive Bhutanese identity now, in the present and future, rooted in, but increasingly distinct from, Tibetan culture. Tibet also, after all, is undergoing modernisation but in a different direction from Bhutan’s. It is precisely in this respect that I would raise one concern with this book: given the fact that the last 100 years have seen the nation undergo the most profound and most rapid changes in its history, it is worrisome that Karma Phuntsho devotes less than 100 out of 599 pages of text to the modern period. It is precisely now, when everything that was “Bhutanese” is changing, is being challenged by the introduction of new institutions and the forces we call “globalisation” that a deeper understanding of modern and contemporary history is essential if we are to reflectively retain a distinctly Bhutanese identity in the increasing homogenisation of the present. Karma Phuntsho is one of the very few Bhutanese thinkers who is thinking constructively about this issue, and this reviewer wants to express the hope that he will turn his attention in the near future to this. The author’s discussion of the modern, while insufficiently expansive in this reviewer’s opinion, is judicious in its caution. As the good historian that he is, he does not confuse the specious concept of “objectivity” with the laudable objective of “balance”. He approaches the ambiguities and potentialities of GNH, for example, with just the right tone of voice. Any history of Bhutan will be constrained by the availability of source materials. Karma Phuntsho has shown how what is available can best be used to trace the history of the nation. If he, or anyone else, is to write the history of the modern with the same depth that he has written about the premodern, the project will depend upon the availability of documentary evidence and research results in many fields, and we should make it the responsibility, no, even more strongly, the duty of public officials to preserve the documentation that will make the writing of modern history possible. Without that documentation, Bhutan’s national identity in the present and the future will weaken precisely because the raw materials necessary for its further development will be too little. Karma Phuntsho devotes some attention in the last part of the book to the development of education (see pages 587589). He correctly criticises important aspects of our contemporary education. What is implicit in his writing needs to be made explicit: education is absolutely crucial for the formation of national identity. Poorly written, weakly conceived and unimaginative history textbooks, in other words, the kinds of textbooks used in Bhutan’s schools to teach Bhutanese history, bore our students and trivialise their sense of themselves as Bhutanese. 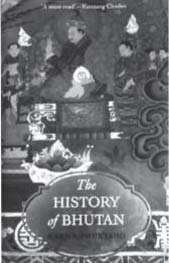 Karma Phuntsho’s The History of Bhutan should be required reading for anyone planning to write textbooks to teach our children Bhutanese history. About Author: Mark Mancall (PhD) is Professor Emeritus of History at Stanford University, California, the USA. He is an expert on the history, religions and cultures of central and Southeast Asia.